Brisbane’s rapidly-expanding brewing scene has just seen the official naming of the city’s newest brewery being built under the Story Bridge. 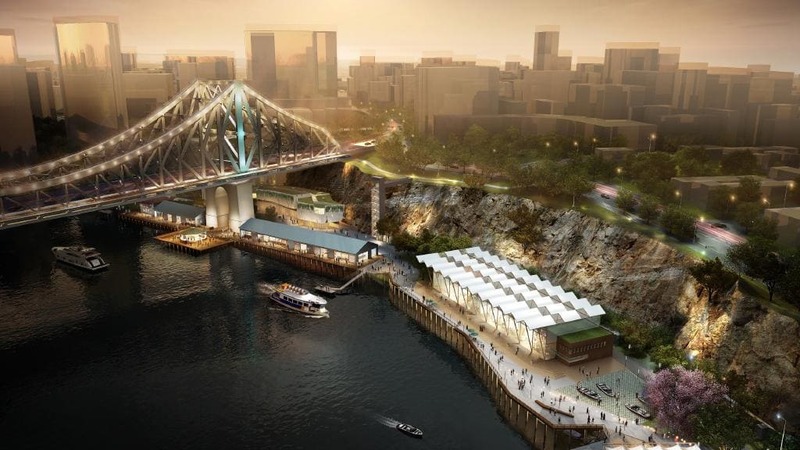 The long-planned venture, named Felons Brewing Co, is a key element of the Howard Smith Wharves redevelopment, named for the four felons who stumbled upon the Brisbane River in 1828. The 1000-square-metre, 500-seat brewpub sees former Little Creature’s Marketing Manager, Ash Cranston, unite with head brewer Tom Champion, also formerly of Little Creatures in Geelong and Hong Kong. The four-vessel, 25-hectolitre DME brewhouse was delivered to the site over the weekend with beers ready to be pouring by October. Champion is currently finalising four beers for the brewery launch, including a New World Pale Ale, an English-inspired IPA, a lager and a mid-strength offering. The brewery takes its name from the – at least in this lifelong Brisbane resident’s experience – little-known story of the adventurers who discovered what is now modern-day Brisbane. In 1823, four felons – Thomas Pamphlett, John Finnegan, Richard Parsons and John Thompson – left Sydney for Illawarra but strong winds blew their small vessel off course, and after 21 days at sea, they were shipwrecked on Moreton Island. After months making their way back to the mainland they found the mouth of a large river, which they explored before settling with a native tribe. A short time after, John Oxley arrived in the region to settle a new penal colony, and the felons showed him the river mouth, which Oxley named the Brisbane River. Founding story aside, Cranston said he isn’t concerned that parallels will be drawn to Australia’s other convict-linked brewery. “There was a long debate about that and the connection to it,” Cranston acknowledges. “And for us it’s really about the focus on the attitude and the journey that they took rather than the that they were of a colonial time. Cranston said the team behind Howard Smith Wharves wanted to tell the story of the city’s founding. “We think it’s a great story, but the second part is it’s a really great story about freedom, adventure and discovery and we really loved the idea of connecting to the lifestyle in Brisbane and Queensland,” he explained. The Howard Smith’s Wharves precinct, positioned under the iconic Story Bridge and looking down two of the city’s most scenic river reaches, is set to change the city’s landscape dramatically, drawing the gravity of the city well past the established Riverside precinct.